Deer Valley Resort is located in Park City, Utah, which is a small town with big opportunities for fun! There are more than 100 restaurants and bars, multiple theaters, many arts and culture events, health clubs, spas and outlet stores. Winter activities include the Utah Olympic Park, ice skating, snowmobiling, snowshoeing, cross-country skiing, tubing, film festivals and World Cup events, just to name a few! Salt Lake City International Airport, located just 36 miles from Park City, is serviced by most major airlines which makes travel in and out of the area very accessible. There are taxi and shuttle services available for transportation to and from the airport. Day and evening entertainment in Salt Lake City includes professional hockey and basketball games, ballet, opera, symphony, dance, theater, museums, historical sites and plenty of shopping. In addition, all within a day's drive from Park City, are 13 other Utah ski resorts, Las Vegas, the Grand Canyon and 15 national parks and monuments. Perks, including health and ski privileges, are offered to Deer Valley employees. Our Grooming Standards help our staff maintain a demeanor and appearance consistent with Deer Valley’s first-class image and the expectations of our guests. Please review our grooming standards prior to submitting an application. Deer Valley Resort sets the standard in the ski industry with our well-groomed staff. Deer Valley Resort has known for a long time that it is our staff who make the resort a leader in the ski industry. With over 1,000 staff members celebrating five or more consecutive years of service during this ski season, it is clear that staff is committed to the success of the company. Our staff, known for being welcoming, knowledgeable, attentive, and approachable, prides themselves on the exceptional customer service they provide. 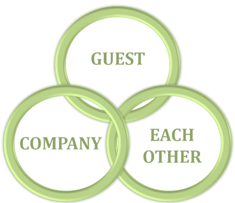 The Deer Valley three-circle business model teaches employees to find the balance between taking care of the guest, the company and each other. They are encouraged to emulate a professional and friendly attitude at all times.